The number of foreign-born workers employed in the United States hit a record high of 25,495,000 in November as the unemployment rate for the demographic hit 4.4 percent, according to data from the Bureau of Labor Statistics. According to the BLS, a foreign-born person is one who resides in the United States but who was born outside the country. Undocumented immigrants and refugees may be included in the data set since the BLS does not distinguish between legal and illegal immigrants. Last month, there were 25,120,000 foreign-born workers employed, which means that the number has increased by 375,000 since then. This number has grown by 567,000 in the last two months alone. There are 4,120,000 more foreign-born workers employed today than when President Obama took office in January 2009. While the number of employed foreign-born workers is increasing, the number of native-born workers has declined. In October, there was 124,597,000 native-born workers employed and in November that number dropped to 124,271,000, a decline of 326,000. The unemployment rate for foreign-born workers remained the same from the previous month at 4.4 percent in November. 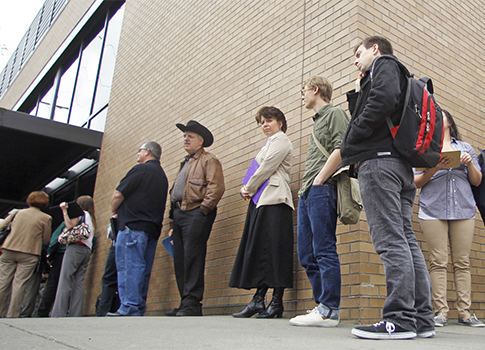 The unemployment rate remained the same for native-born workers at 4.9 percent. This entry was posted in Issues and tagged Unemployment. Bookmark the permalink. Ali Meyer is a staff writer with the Washington Free Beacon covering economic issues that expose government waste, fraud, and abuse. Prior to the Free Beacon, she was a multimedia reporter with CNSNews.com where her work appeared on outlets such as Drudge Report and Fox News. She also interned with the Heritage Foundation and Pacific Research Institute. Her Twitter handle is @DJAliMeyer, and her email address is meyer@freebeacon.com.